The Knife of Dunwall will lead you on all-new adventures through never-before-seen parts of Dunwall as the infamous assassin Daud. I don't think there's any question that Daud, the gravel-voiced leader of the Whalers, is the most interesting character in Dishonored, a talented man who did a terrible thing and now struggles with regret as he clutches at the tattered shreds of his humanity. And soon you'll have a chance to experience the bleeding of Dunwall from his tortured perspective in The Knife of Dunwall, the single-player Dishonored DLC slated for release next month. Marked by the Outsider in much the same way as Corvo, Daud has access to his own range of special powers, including the ability to summon Whalers to his side in combat, as well as variations on existing powers like Blink. He also brings a few customized party favors to the game, like "Chokedust," whale-oil-powered Stun Mines and the obligatory concealed Wristbow. Daud's adventures will take him through Dunwall's Legal District and the Rothwild Slaughterhouse, a factory filled with gigantic whale carcasses. He'll also return to the Whaler's base in the Flooded District and experience "key events" from the assassin's perspective, including the moment that changed Dunwall forever. 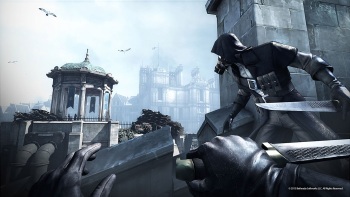 Just like Dishonored, each mission can be approached in a variety of ways, and the choices Daud makes can set him on the path to redemption or lead him even further into darkness. The Knife of Dunwall is the first chapter in the story of Daud, which will conclude in the future, final add-on, The Brigmore Witches. Look for it to come out on April 16 for the Xbox 360, PlayStation 3 and PC, at 800 Microsoft points or $9.99.